On Saturday, we returned to the wetland trail at Raccoon Creek park. It was quiet this time and we only encountered catbird fledglings, one warbler, two bluebirds and numerous Canada geese. The sound of bullfrogs frequently interrupted the silence. I had taken my camera along, but did not take many photos. The hot and humid weather (not to mention insects) soon diminished any idea of staking out birds. At home, we are busy planting and watering flowers in our new native garden. It doesn’t look like much right now, but we’re hoping that the recent rain will spur on our seedlings to grow. We are still feeding birds and they are beginning to bring their fledglings to our feeder. They are as big as their parents and it is quite amusing to see such big birds begging for food. We are still seeing a male rose-breasted grosbeak and I hope it will stick around. If we could find a bird fountain, then we would be able to see our birds taking a refreshing bath on a hot summer’s day. Oh well, we’ll keep looking. Something will come up eventually. For the first time this year, we headed to Raccoon Creek State Park yesterday. The weather was less than stellar – it was cool and very windy. I therefore left my camera at home and brought my binoculars instead. With such winds I would have been hard-pressed to find a branch that was still long enough to take a decent photo. Because we’re also interested in wildflowers, our first stop involved trilliums and other spring bloomers. On the wetland trail, we saw a Catbird, several warblers (one was probably a yellow warbler, the others were harder to identify), two Baltimore Orioles, countless robins, and a couple of bluebirds. 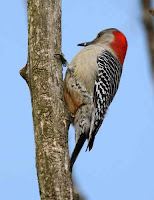 At home, I had some rarer sightings lately: a Northern Flicker and a White-crowned Sparrow. The Rose-breasted Grosbeaks are still around, too, and I’ve taken lots of photos of them. To provide some natural food for the birds this summer, we started another wildflower garden. May seems to be the busiest month of the year. One of the problems with hanging up bird feeders is that you’re also attracting less desirable creatures. At the moment, that would be cowbirds. For weeks now, they have descended on our feeders, eating everything in sight. Of course, the obvious solution would be to stop feeding birds. But then I wouldn’t be able to see the rose-breasted grosbeaks that are hanging around lately. They are big eaters too, but at least they don’t lay their eggs in other birds’ nests. We are on our last bag of birdseed now and when that’s gone, they’re on their own for the summer. We are planning on adding another small native garden where birds and insects will be able to find natural food sources. And we’re trying to find a bird bath with flowing water, which is more difficult than we expected. Last Saturday, we went to Sewickley Heights park hoping to see some warblers. We saw a few towhees and I commented that we had not seen any at home lately. Shortly after we returned home we looked out the window and there was a towhee. Ask and you shall receive. http://dorisdumrauf.com/wp-content/uploads/2013/04/avatarblank-240x300.jpg 0 0 admin http://dorisdumrauf.com/wp-content/uploads/2013/04/avatarblank-240x300.jpg admin2009-05-07 17:40:002009-05-07 17:40:00Cowbirds, oh my! Things are getting exciting in our backyard now. While we still see a white-throated sparrow around, the juncos seem to be gone. Unfortunately, we have a small flock of cowbirds around. 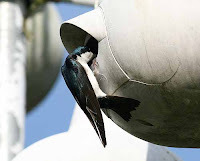 I don’t like to see them because they put their eggs in other birds’ nests, but there isn’t much I can do about them except taking down the feeders. But then we would have missed out on a sight yesterday. First, we spotted one male rose-breasted grosbeak at our sunflower feeder. Soon, I noticed another male in our neighbor’s pear tree. A female was not far behind. They all came to our feeders and ate…and ate…and ate. Did I mention that they ate? They are beautiful birds and have a pretty song, so how can I complain? Yesterday, we also hung up our hummingbird feeder. We usually see our first hummer around May 1, but it can’t hurt to be ready. The recent winds we had might carry them here earlier than normal. And what’s normal around here when we have 88 degree weather in April? I’ve been honing my bird photography skills in our backyard lately, sort of like spring training after a long winter. Today, we went on our first bird outing. We drove to Independence Marsh in Beaver County and were not disappointed. We had not even left our car when we already spotted a killdeer, tree swallows, Canada geese with goslings, and the ever-present shriek of red-winged blackbirds. Besides the tree swallows, we had other firsts of the year: first female and male blue bird, first yellow warbler, and my husband saw a waterthrush. While rambling around, we flushed a couple of ducks out of a tree, saw a mockingbird, a mystery bird, and two turkey vultures in the distance. All the while we were entertained by the incessant call of frogs and the dragonflies that were out and about. It sure was noisy out there, but it was a pleasant sort of noise. I was disappointed that we didn’t see more waterfowl, yet the arrival of spring migrants was a pleasant surprise. Finally, the wind and the heat – too hot for April – got the better of us and we drove home, happy and exhausted at the same time. When the weather is agreeable I am out in the backyard photographing birds. Last Friday, I spotted a dark-eyed junco eating seeds underneath our feeder and a white-throated sparrow that landed on a branch. I had not seen any white-throated sparrows for a while and had wondered whether they had left yet. Winter is not officially over until these migrants have returned to Canada. Yet, the next day my husband spotted a sparrow with a particularly white breast. Apparently, I had seen the tan-triped variety. I have also seen (and heard) cowbirds in our yard recently. And let’s not forget the red-winged blackbirds that pass through every few days. In a few days I’ll have to prepare the first mix of hummingbird syrup because these little flying machines show up around May 1 or 2. I wouldn’t want them to pass up our yard because I forgot to hang up a feeder. I am less fortunate with an oriole feeder. For a couple of years, I hung out an oriole feeder after spotting an oriole in our neighbor’s tree. But, none of them ever visited my feeder and it’s now collecting dust. Yesterday was a gorgeous day and most importantly, it wasn’t windy. 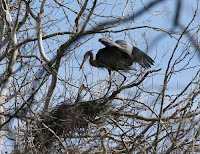 We therefore headed out to Big Sewickley Creek Road near Ambridge to view the Great Blue Heron rookery we had discovered last year. There must have been 20 or more nests, but photographing them was difficult. Many branches obstruct the view, making focusing and taking a decent photo almost impossible. To show you what I had to cope with I’m including some of my photos here. Every now and then, one heron took off in flight and glided over the valley. I could never figure out where they flew. When they returned with a stick in their beak they “handed” it to their partner who was busy outfitting the nest. Occasionally, a fight erupted and the herons honked at each other, almost sounding like Canada Geese. As a bird photographer and bird lover, it is my objective to lure birds to our backyard. Feeders are the obvious choice, but the feed can be pricey. Much more natural, if you disregard the initial price tag, is planting trees and shrubs for birds. For years, I’d been longing to get a serviceberry. Everything about them seems perfect: Their spring blossoms are beautiful, their nectar feeds insects, their fall foliage is attractive, and birds and people savor their berries. There was one problem, though. We had no space to plant another shrub without removing something else. Last November, we finally had our silver maple removed. Not only did its shallow roots grow too close to our patio, but the tree itself was so vulnerable to storms that we feared it might fall onto our house or car some day. Lesson learned: Don’t plant a tree that has shallow roots. On Saturday, we set out to buy a serviceberry. Luckily, the selection was much better than years ago. The nurseries seem to carry more native plants than they used to and our biggest problem was what size shrub we wanted to buy. The smallest ones were quite inexpensive and would have fit into our car, but they would take years to mature. We settled on a medium sized shrub (about eight feet) that will hopefully bear fruit this year or next year. Will we attract cedar waxwings with this shrub? We shall see. Until yesterday, our backyard was quite uneventful this week – that is, if you don’t count hawks. We have had quite a few red-tailed hawk sightings lately. Sometimes they fly right through our yard. Last evening, we saw our first eastern towhee of the year and I saw it again today. I also noticed that the goldfinches are beginning to molt. Those are two signs that spring is here to stay.